After long, long time I have back to eclipse as a main IDE for Grails development. There are two reason to do that. First, my license on IntelliJ was token (end of project == end of license), and before I give lots of $ for my own copy of JetBrains product, I want to test an alternative solutions. Second, I wanted to test Spring Source work (honestly!). What I have remembered from my last contact with Eclipse + Grails combination was pain. Not even pain but PAIN. But, almost 2 years ago there wasn't to much alternatives. Yes, there was IntelliJ but even my beloved IDE wasn't perfect. But now, everything changed. Grails became popular framework, Spring buy it and rush began in IDE development. So how its looking now with STS and Grails? We got new project explorer view with nice separations of project elements (controllers, services, domains and so one). What is nice, STS will handle plugins and dependencies and display its source in explorer too. Even more - it will handle project that base on plugin oriented architecture. Sweet. Other nice feature will appear when you press Alt+Ctrl+Shift+G (ok, one finger left). 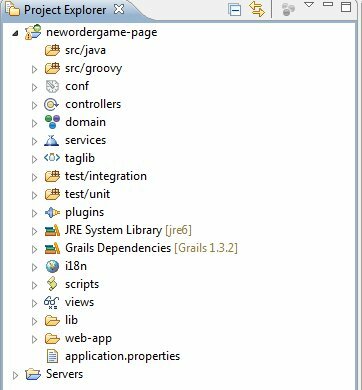 Its Grails console, with autocomplete (just write "ins" and press Ctrl + Space) similar to console used in Roo/STS integration. What most important, code autocomplete is working. We can navigate through project classes structure, plugins and dependencies. So is everything shiny? Unfortunately no - in my case there were some problems with import visibility: even if class was correctly reflected, and autocompletion shows methods (even dynamic, yupi!) eclipse shows nasty error in line where import statement was. Fortunately "clean project" allows to correct this problem. STS will not see ADMIN and PLAYER fields. So, what opinion I give to Spring Soruce IDE? Not bad. I will stick to it for now. Definitely I am able to work with Grails project without headache. There are still problems, but not critical. IDE is still evolving and I am sure that in near future it will be great tool. But to be hones, IntelliJ at this moment is just better. At this moment there are available chapters where you can read e.g. about geolocation, local storage, off-line web apps, canvas or video . Mark describe with details how to detect Html5 features in your browsers (Modernizer library shown as generic solution), structure of html5 web page or even the history of img tag. Numbers of links to other sources, allows to dig subject more deeply. Even if some features are not supported by all browser, Marks give us hints about other solutions that can be used in place of it. There are still some chapter that are missing (threads, socket) but even now this is one of best materials about Html5. New version of Grails plugin for image manipulation released. Current version ships with ImageMagick support. To read more go to project home page.